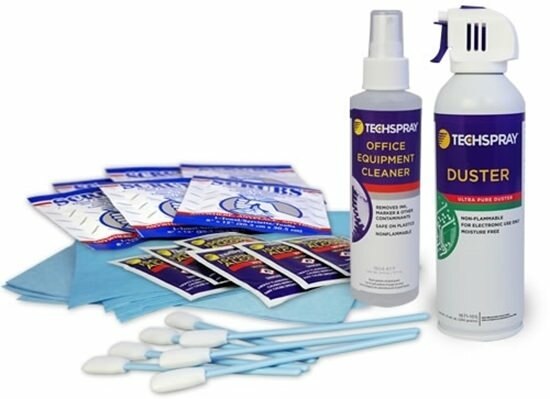 Techspray Office Equipment Cleaning Kit contains a convenient, effective assortment of products that provide necessary tools for properly maintaining office equipment. 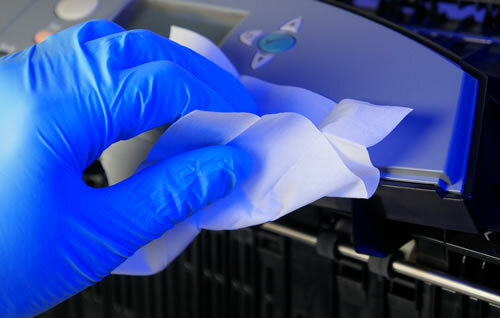 The combination of a water-based cleaner, duster (canned air), pre-saturated wipes, lint-free dry wipes, and swabs are ideal for cleaning postage meters, printers, fax machines, copiers, label printers, desktop printers, and much more. Keep your high volume mailing systems and office equipment running at peak condition. This kit is ideal for field service technicians that support specific brands of equipment. Technicians commonly purchase their own cleaning supplies as needed from consumer retail stores. Without a qualification process to make sure that all of the supplies are safe for sensitive electronic office equipment, they run the risk of damaging the very machines that they are contracted to maintain. With over 40-years’ experience developing electronic cleaners and maintenance supplies, Techspray products are proven to be both safe and effective. The Office Equipment Cleaner is a water-based solution that will not damage plastic, rubber or metal surfaces, yet is strong enough to remove a wide variety of inks, toners, adhesives, and other contamination. Techspray Duster provides a powerful blast to blow away paper dust and other loose particles that can impede equipment functioning. Unlike aerosol dusting gas commonly found at consumer retail stores, the duster is nonflammable and does not contain any additives like bitterants and fragrances that can actually add contamination. The alcohol wipes included with the kit are 99.8% pure alcohol on tear-resistant, lint-free material. To clean tight areas and a wide variety of surfaces, dry swabs and wipes are also included that are strong, lint-free, and have high absorbency. With the Techspray Office Equipment Cleaning Kit, it isn’t only about taking care of the equipment. Gloves are included to offer protection when the maintenance work gets particularly messy. If you do get toner and ink on your hands, Scrubbs Hand Wipes are included, which clean your hands without drying them out and leave a pleasant citrus fragrance. Grant Price, Techspray Product Manager, says that Techspray’s new Office Equipment Cleaning Kit gives field servicers a new tool in their toolbox to properly maintain office and label equipment. It also gives the service companies more control over the quality of their field techs’ work.